In a region that offers everything from sunrise hot-air balloons to open-air concerts and guided horse riding, it's surprising that these are only really considered the fringe-benefits of a weekend in the Hunter Valley. Rather, it's the wine that brings Sydney-siders and tourists alike to the region in astounding numbers each weekend. Boasting superb wine, craft beer, boutique restaurants and gourmet cheese and chocolate, this is a space where diets are left firmly at the door while decadence reigns free. Celebrated for its fertile agricultural assets, the Hunter Valley calls on visitors to indulge on incredible local produce. The best Hunter Valley wine tours from Sydney cross the Harbour Bridge and pass Ku-Ring-Gai National Park on the way to Australia's premium wine region. 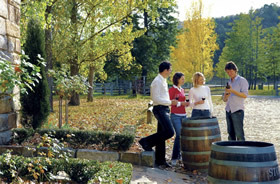 Visiting around three wineries in a day, guests have the opportunity to speak with the winemakers, sample the renowned wines and explore the spectacular vineyards. Alternative private Hunter Valley wine tours include an air-conditioned drive to the region where small groups enjoy three private wine tastings in the world class vineyards. Followed by a two-course lunch and private winery tour, visitors are guaranteed an exclusive experience. Learn about the wine making process, purchase wine to take back home and imbed yourself within the native Australian surrounds. Included in some tours is a visit to the Australian Reptile Park where guests have the opportunity to meet kangaroos, pademelons and wallabies with their morning tea. Hunter Valley overnight tours from Sydney are readily available, including a nights accommodation in one of the beautiful local hotels. Wake up with the sunrise to find the fields awash with a golden glow.